Fancy a bag of chunky chips while watching the sun setting? Or pizza by the playground? 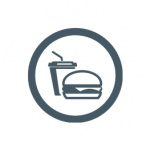 Eat-in or take-away, Ballybunion has a wide selection of fast food options.